Day of rest. Went to church as usual. We had good talks in the Sacrament meeting on the proper use of time. One speaker quoted Alma 34:32-34 which discusses the problems that result from procrastinating the day of your repentance. I like those verses very much for their intended meaning, but I also like this somewhat humorous application of the scriptures. In verse 33 it says "if we do not improve our time while in this life, then cometh the night of darkness wherein there can be no labor performed". I take it to mean the time it takes you to run the marathon. In that sense, I do need to hurry, as the night of darkness is approaching. I am 38 years old. I have kept myself in good health, and have been able to hold off the aging. But I will not be able to do it forever. That is when the "night of darkness" spoken of comes about as far as running is concerned. Fortunately, the real night of darkness comes only if you have willfully chosen to disobey the commandments of God. So even if I do not improve my time in the running sense, I am still OK as long as I do my best to serve the Lord. But I would like to improve my running time regardless. A.M. Total of 12. Some with the kids. Jenny and Julia ran 3 with Sarah. I ran 3 with Benjamin, 1 with Joseph, and 0.5 with Jacob. Then some more. Did 2 pickups of 1.25, first in 7:02, second in 7:01. A.M. 12 miles as usual. Did 4 with Benjamin. Jenny and Julia ran 3 with Sarah. Joseph did 1, Jacob 0.5. I was feeling like I should run a tempo, so I ran out 3 miles on my 20 mile course, and ran the same 3 miles back as a tempo. I knew I should be able to average 5:30 on it, but it sounded intimidating to do it alone. But I went anyway. Opened with 2:42 half, then 2:46 (5:28), then I hit an area with two sharp turns, a wooden bridge, and two tunnels, and this gave me 2:49 for the next half. I got mad about that and ran the next half in 2:44, although it still had a tunnel. So that was 11:01 for two miles. I battled the next obstacle quarter (tunnel under 820 N) with an 85, and then I was really mad and ran 81, 82, 80 to finish the tempo in 16:29.6, right on target. P.M. 2 miles. Got motivated in the last quarter and ran it in 82. A.M. 12 miles total. 5 with Benjamin. He is more or less back to full health after catching a minor cold earlier. Nevertheless he tried to use that cold as an excuse to not participate in his on-the-run Russian lesson. His attitude about Russian is maturing, though, as he is beginning to realise that it will likely be the language he will speak when he goes on a mission. He is at the point where he is able to hold a meaningful conversation, although he still has a lot of seriously gaping holes in his knowledge. Of course, those holes are gaping to me because I am a native speaker. By the way, if anybody wants a free on-the-run Russian lesson, I'll be happy to teach it to you. Thanks to our politics of not shooting for the stars, both figuratively and literally, Russian fluency is now required by NASA if you want to be in the space program. Contact me to make the arrangements. I did a tempo yesterday, but I found myself in a situation where I knew could catch Sarah if I ran 2 miles at sub-6:00. I could not resist the temptation and figured a nice marathon pace or so effort would be good for my training. So I ran 2 miles in 11:32. First mile in 5:52, that was an honest marathon pace effort, then 90 through the obstacle quarter, and then Sarah was within my sight and I had to show off. We've been married almost 15 years (Nov 29th is the anniversary) and had seven children together, but I still cannot help but show off in some way to impress her when I get a chance. It is subconscious. So I picked it up and ran 84, 83, 83 which gave me 5:40 for the last mile. P.M. 2 miles. Again felt motivated in the last quarter and ran it in 80. A.M. 12 miles. 5 with Benjamin. Joseph did 1. Jacob 0.5. Jenny and Julia ran 3 with Sarah. In the early miles I ran 0.75 in 3:59, and it felt harder than it should have. Benjamin and I ran into Jeff Coombs. I decided to surprise Benjamin with a fast 0.5 and challenged him and Jeff to follow me at about 5:20 pace. Benjamin's assignment was to learn to draft without feeling panicked about being dropped. I took them through a quarter in 81, then picked it up and ran the next one in 76, so 2:37 for 0.5. This time 5:04 pace felt a whole lot better, I felt like I could keep it for a while. Amazing how much having company makes the pace feel easier, even if you are leading. A.M. 12 miles as usual. Ran a good portion of it with the kids. Came up with an idea of how to run with Jenny and Julia. 1.5 out with them, then a quarter out and quarter back, and then a tempo mile to catch up. I see them for most of their run, get to run total of 2 with them, and I get a total of 3.5 with 0.5 at 7:00 pace, and 1 mile at a tempo pace. So we did that, and I ran my tempo mile in 5:37. Also did 5 with Benjamin. A.M. 20 miles total. Did the first 10.25 with the kids. First, did my 3.5 with Jenny and Julia running 3. I did the tempo mile in 5:36. Then 0.5 with Jacob and 1 with Joseph. Then 5.25 with Benjamin. He did a couple of pickups to catch runners in front of us which gave me 0.5 of tempo. Then I weighed myself at 142.4 lb and went on to finish the rest of the run. I decided to do a mild tempo - 5 miles targeting 86 quarters, or 5:44 per mile. I started the tempo after having run about 13.4 miles total for the run, and did it of the Fast Running Blog 5 miler course. The start was very sluggish - 89 followed by 87 after I had given myself a kick in the rear. After that I was awake, found the groove, and started gradually eating away at the 4 seconds I had lost. My split at the turnaround was 14:22, 2 seconds behind pace, so I gained 2 seconds, but then I lost them on the turnaround. I got mad about that, found the rhythm again after a couple of quarters, and was within 1 second of the pace with a mile to go. The pace up to that point felt good, but to go faster required a visit into a different dimension. Even though I say the pace felt good, it is all relative. I was in another dimension already. I do not realize these things until I see a passerby on the road. When he enters the area of my peripheral vision, he disappears. Somehow I am able to concentrate to the point of turning it off. 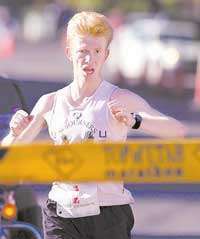 Yes, it takes that much concentration for me to run sub-6:00. Once I had only a mile to go, I finally found the courage to visit that other dimension. I did the last mile in 5:34, which gave me 28:31.6 for the tempo. I jogged some more, and with 0.5 left I decided to test my fuel levels. They were better than last week. I ran 90 and 87 quarters - 2:57 for 0.5, 5:54 pace average, and I felt that I had another gear yet. So it was not bad at all. After the run I weighed at 141.6 lb. So that is the difference for me - 138.6 lb resulted in 93, 93 for the last two quarters with no other gear available. P.M. 2 miles. Did another fuel test in the last mile - got 5:42. First quarter was 89, then I kicked into gear, and did 86, 84, 83. Felt strong.